ITALY IMMIGRATION WILL OPEN OR NOT? Immigration open in 2019.we heard from many peoples.they said Italy immigration is going to open in 2019 But we can see some situation in Italy.they are ready to open immigration.it is possible.We can see in past,Italy open immigration for Asylum Seekers for Settlement and get papers and pay the taxes to Government of Italy.But after left many year,s Italy cannot decide to open immigration because so many asylum seekers come in Italy but they did not like to go back to his own destination therefore Italy Government not accept the case of new asylum seekers.it is affect the Italy economy because people,s eat and work in Italy but when the time comes to pay tax than they dont pay tax therefore it is very big problem for economy. 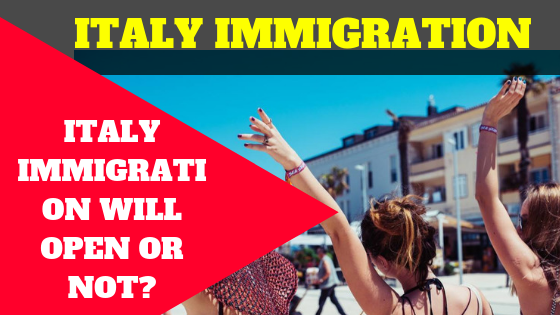 If you are legal entry in Italy.you obtain visa and travel to Italy legally than your casewill be approved soon but sometime in the case of other asylum seekers who enter the Italy wrong way than that case takes so much time to process your application. This Time Immigration open now.you need to wait more for the opening of the immigration.